Revisiting conspicuous art theft, we’re happy to say that this time, at least, the thief has been caught and the art recovered. 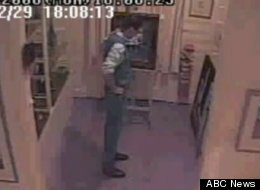 New South Wales lawyer Michael Sullivan, seen here on CCTV examining two paintings by artist James Willebrant (after a moment’s indecision he decided to steal them both), pleaded guilty in May and was sentenced last week by an Australian court. We’re less happy to report he walked. Sullivan, apparently a friend of the court, logged the not-so-novel defense: “I have no recollection.” He claimed to investigating police, who located the paintings hanging on a wall in his home, that he’d purchased them from the Katoomba Fine Art Gallery. Confronted by the surveillance-cam evidence, he disavowed all memory of the theft. The court accepted his guilty plea, and also his apparent dissociative amnesia diagnosis, and released him on “good behavior” bond. No jail time. It’s hard not to be cynical about such an outcome (and re-reading the above, we see we haven’t even tried). On the one hand, it’s great that the paintings, valued together at $14,500, have been returned to the gallery–such a resolution is all too rare in art theft. On the other hand, the thief, although readily caught, has accepted no responsibility for his actions, nor have the courts handed him any. That’s hardly a deterrence. 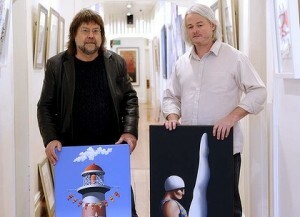 Artist Willebrant and gallery director Geoff White are pleased to have been returned the artwork, but agree that Sullivan should have faced some jail time. Unless Sullivan violates his bond that’s not going to happen. So the interests of justice will have to be served with that most ancient of punishments, public shaming. With that in mind we send out this warning to our Australian friends: lock up your valuables when Michael Sullivan is around. He’s a no-good dirty thief. This entry was posted in New Post and tagged art theft, Australia, Geoff White, Katoomba Fine Art Gallery, Michael Sullivan, New South Wales. Bookmark the permalink. 2 Responses to Art theft by amnesia? Interesting story. I have met Sullivan in PNG and it is well known by those close to him that he has committed similar acts involving art in PNG. Absolute crap that he suffered from amnesia but I am sure he has soime psychiatric disorder.